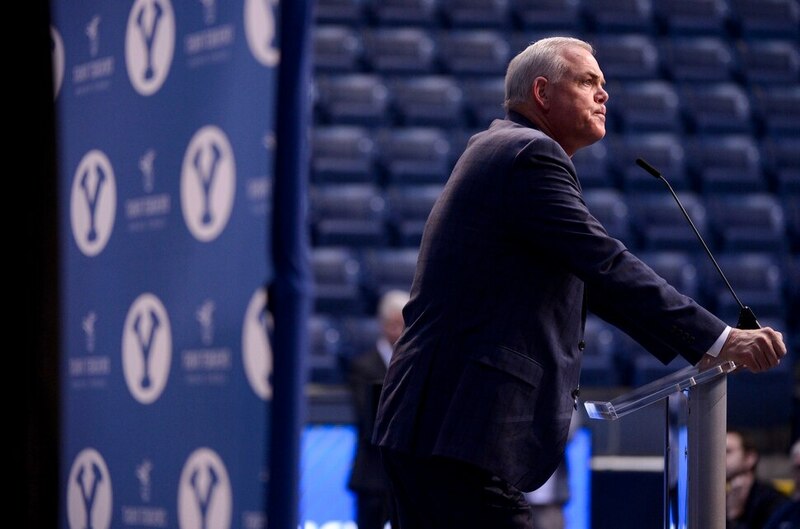 Provo • Dave Rose said that it was one of the most difficult things he’s done in awhile, but he never cracked, or got overly emotional, Tuesday morning when he told his players he was stepping down after 14 seasons as BYU’s head basketball coach. He saved the tears for Tuesday afternoon’s farewell news conference, apparently. The two-time cancer survivor who became the winningest coach in program history and lifted the Cougars’ national profile by taking his teams to eight NCAA Tournaments and the Sweet 16 in 2011 with national player of the year Jimmer Fredette, made his retirement official in a tear-filled gathering at the Marriott Center that was a mixture of a question-and-answer session with reporters and testimonials from family members. 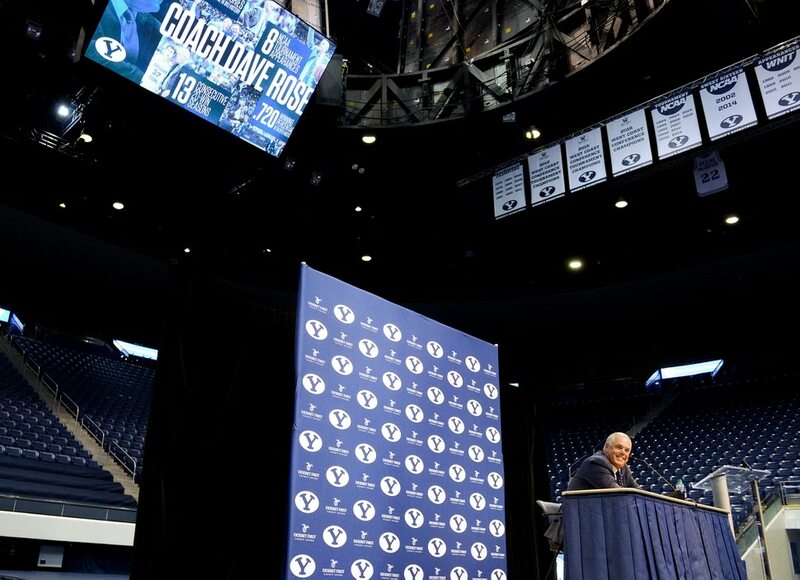 Surrounded by his wife, children, grandchildren, current and former players, and BYU athletic director Tom Holmoe, who never acknowledged that the coach was pushed into retirement, as many suspect, Rose said it was time to step down. Rose was on coach Steve Cleveland’s staff at BYU from 1997-2005, then took the reins when Cleveland left for Fresno State. He compiled a record of 348 wins and 135 losses for a winning percentage of .720, including a 200-27 record at the Marriott Center. Rose said he told his players last week that “it was possible” that he might step down. 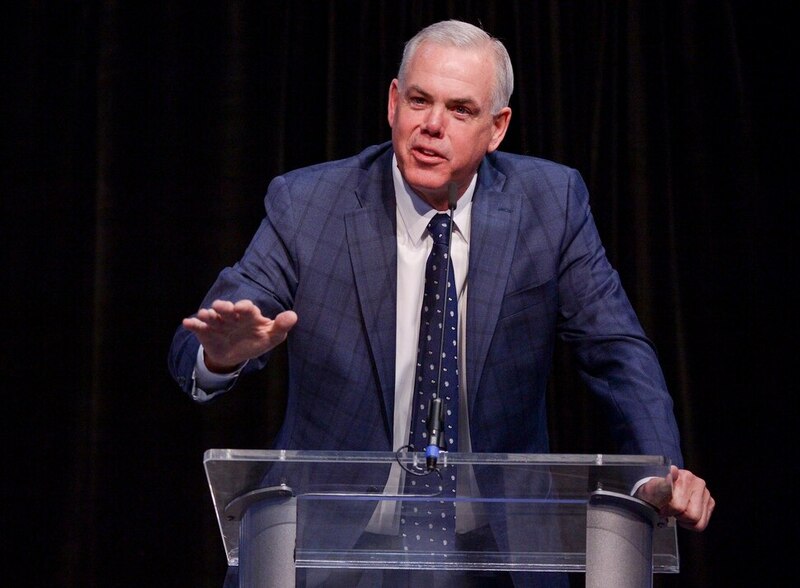 Rose, Holmoe and other BYU administrators met several times last week to discuss a possible buyout to the two years remaining on the coach’s contract. Before Rose spoke, Holmoe said that the day was “all about Dave Rose” and he wouldn’t be discussing possible successors. Quincy Lewis, who has been an assistant at BYU since 2015, has been named interim coach. Now, Holmoe has a basketball coaching search on his hands. That search will be narrow, considering head coaches at BYU — which is owned and operated by The Church of Jesus Christ of Latter-day Saints — must be members of that faith. Some of the early candidates include Utah Valley coach Mark Pope (a former BYU assistant), Dixie State University coach Jon Judkins and Portland State coach Barret Peery. Some BYU boosters would like to see either Los Angeles Lakers assistant Mark “Mad Dog” Madsen or Utah Jazz assistant Alex Jensen get the job. Madsen interviewed for the assistant coach position that went to Lee Cummard last year, while Jensen, a former Utah Ute, has never expressed interest in leaving the professional ranks. BYU’s best player this past season, junior forward Yoeli Childs, said the announcement caught him by surprise because Rose never seemed to lose his passion for coaching during the recently completed season that saw the Cougars go 19-13, the first time in the coach’s tenure that BYU did not win 20 games. Childs is expected to leave BYU shortly and turn professional but declined to acknowledge that Tuesday because he wanted all the attention to be focused on Rose. Rose retires 23 wins short of catching Hall of Fame coach Stan Watts for most wins (371) in school history, pending the school’s appeal of an NCAA violations ruling last November that could possibly strip BYU (and Rose) of 47 wins. Asked why he didn’t stay to catch Watts’ record, Rose said his family members asked that question as well. He told them “numbers on a page” don’t really matter to him that much. Rose said he spent the morning meeting with his current players and calling former players and assistant coaches to tell them he was stepping down. Rose began his 14th season with the seventh-highest winning among active NCAA Division I head coaches. He guided BYU to eight NCAA Tournament appearances and five appearances in the National Invitation Tournament (NIT). However, the Cougars’ last NCAA Tournament appearance was four years ago, a loss to Ole Miss in a First Four game in Dayton, Ohio, and it missed out on postseason play this spring for the first time in his tenure. Rose asked his wife, Cheryl, to speak for a few minutes and also asked that his entire family stand and be applauded. Dave Rose expressed regret that he could never get the program back to where it was when Fredette led the Cougars to the NCAA Tournament’s Sweet 16 in March 2011. The perception is that it has been on a gradual decline since the Cougars went independent in football in 2011 and placed basketball and most of their other sports in the West Coast Conference. The coach also struggled to keep top players from transferring or heading to Europe to play professional basketball, as Eric Mika and Elijah Bryant did the past two years and Childs is expected to do this year. The Cougars beat rivals Utah, Utah State and Utah Valley last season but were upset by Weber State, blew a 14-point lead to San Francisco that cost them a No. 2 seed and double bye in the WCC Tournament, and went 19-13. Their season ended in the quarterfinals of the WCC tournament with an embarrassing 80-57 loss to San Diego, a team they swept in the regular season. BYU trailed by as many as 44 points in the game at Orleans Arena in Las Vegas and frustration was evident on the bench in the second half and during the postgame news conference. Falling attendance at the Marriott Center might also have been a factor. The Cougars averaged 11,958 in 16 home games this season, 29th best in the country, but 2,362 fewer fans per game than last season. It was their lowest home attendance since the 2005-06 season, Rose’s first year. Many programs around college basketball have experienced drop-offs in attendance but few that drastic in a single year. Finally, there was the Nick Emery fiasco. The Cougars’ junior guard was suspended and the program was sanctioned by NCAA after it determined that Emery had taken improper benefits from BYU boosters, including trips and the use of a car. The NCAA forced BYU to vacate 47 wins and put the program on probation for two years. Emery was reinstated last December after serving a nine-game suspension and played the rest of the 2018-19 season. The school is appealing the penalties. Despite what many have seen as the program leveling off the past few years, Rose signed a one-year contract extension last November, a day before the Cougars opened the season at top-10 Nevada. The agreement was supposed to take him through the 2020-21 season. Rose told The Salt Lake Tribune at the WCC media event last October that he wasn’t close to retiring and and couldn’t see himself doing anything else. “I just hope it never happens. That’s the way I feel right now,” he said, noting that he has been free of cancerous tumors on his pancreas — diagnosed in 2009 and again in 2011 — for more than a half-dozen years. Note: BYU played in the Mountain West Conference through 2010-11 season, moving to the WCC in 2011-12.